Like all employers, farmers are grappling with an increasingly complex world, and this requires a certain level of knowledge. For the first time, our region is playing host to this year’s provincial AGRIcarrières colloquium, an essential gathering to discuss employment, human resources, and agricultural training. The event is intended to give today’s agricultural employers the tools they need and broaden their horizons on how to use their creativity to recruit labour in a context of shortage. A variety of topics will be covered, including labour standards, equity, workplace health and safety, workplace inclusion, and training. An impact study of a minimum wage hike for the agricultural sector will also be presented. The day-long event takes place at the Imperia Hotel in Saint-Eustache. For further information, visit agricarrieres.qc.ca. Despite the fact that a $1.3 million budget was approved in December to build the Mirabel train station within a productive agricultural zone, the UPA Sainte‑Scholastique‒Mirabel Syndicate is not ready to throw in the towel. At a meeting on January 22 with André Fortin, Minister of Transport and MNA for Pontiac, the UPA reiterated the position it has held since the very beginnings of the project in 2005: farmers do not oppose the construction of a train station in Mirabel, provided that urban sprawl is contained and the agricultural zone is not compromised. The local syndicate continues to point out that a suitable location to build the station exists within an urban zone. Minister Fortin listened with an open mind and committed to bring the matter to the attention of Laurent Lessard, Minister of Agriculture. Various UPA bodies are expected to make representations and take joint actions on this file over the coming weeks. 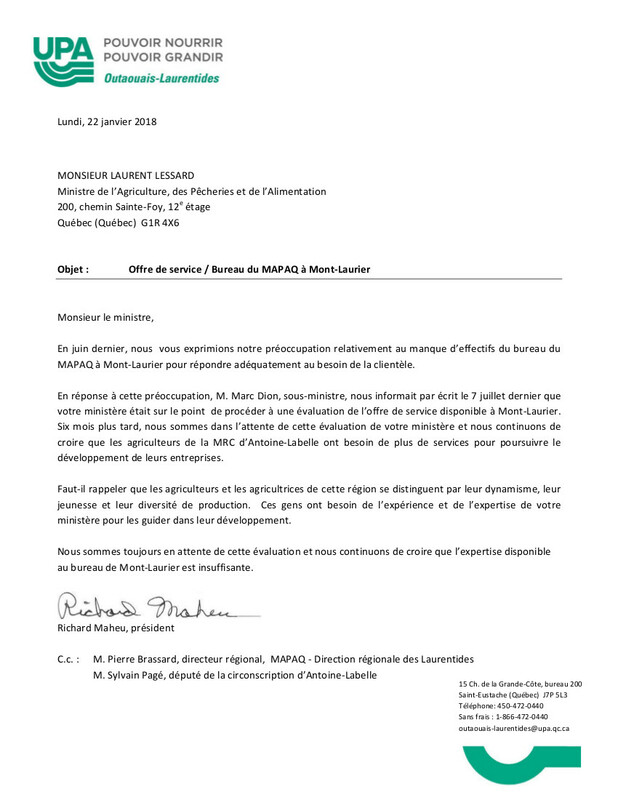 Producers in Mont-Laurier continue to face a gap in professional resources at the regional MAPAQ office, despite the fact that an initial letter calling for action to address this was sent to the Minister of Agriculture in June 2017. On January 22, the UPA Outaouais-Laurentides Federation sent a second letter to the Minister once again asking for a larger staff. 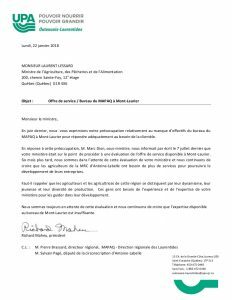 This correspondence garnered the interest and support of Sylvain Pagé, MNA for Labelle, who serves as president of the Committee on Agriculture, Fisheries, Energy and Natural Resources.